"... in May 1718, Martín de Alarcón led the expedition that founded San Antonio de Valero Mission and San Antonio de Béxar (or Béjar) Presidio, named in honor of the family of the dukes of Bexar. 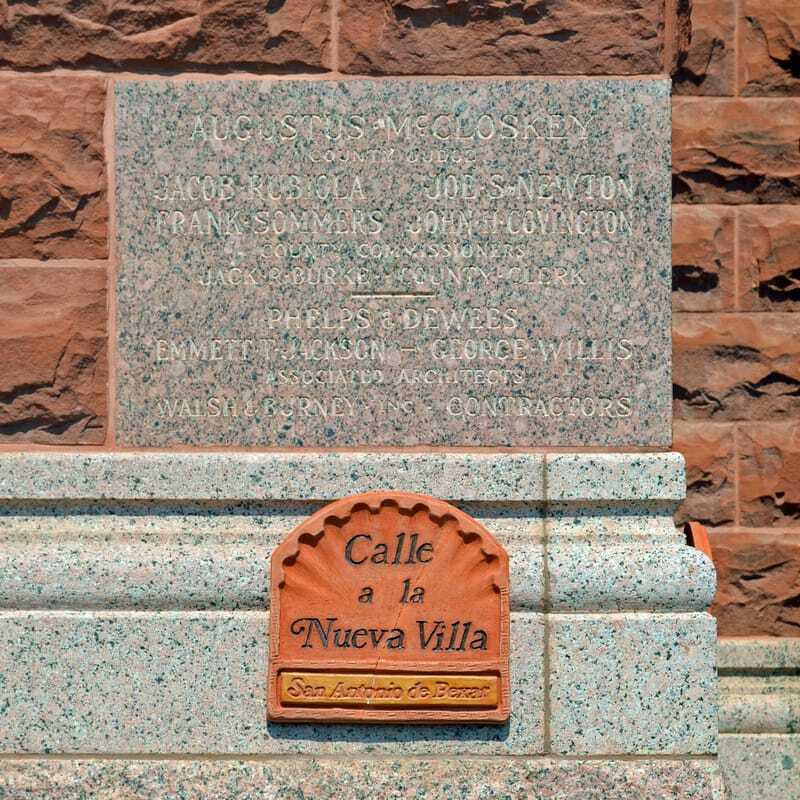 "On March 9, 1731, fifty-five Canary Islanders arrived at Bexar, and the villa of San Fernando de Béxar became the first municipality in the Spanish province of Texas. 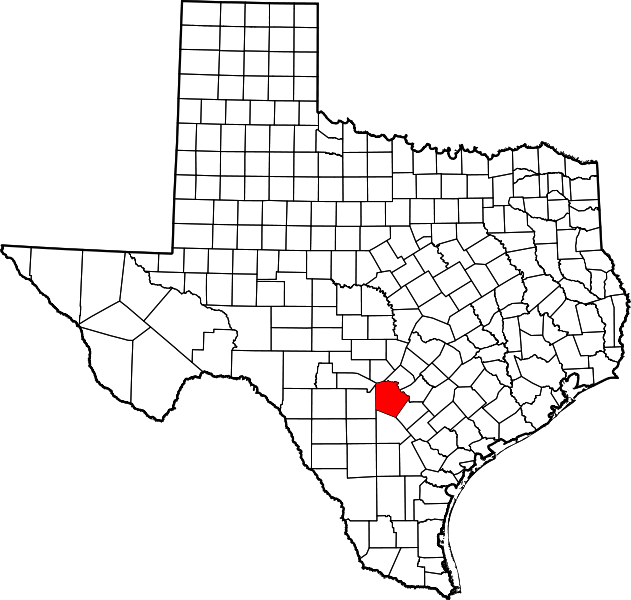 satellite civilian communities under the authority of the town of Bexar. 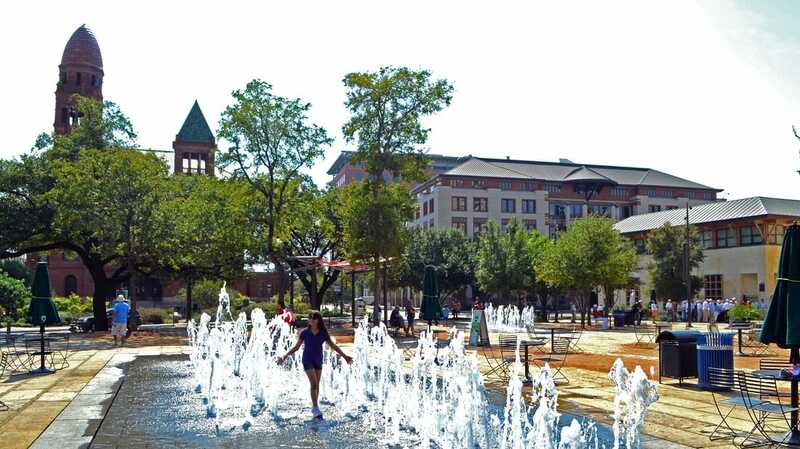 "During the late 1820s and early 1830s increasing numbers of American settlers began moving to San Antonio, though the city remained pre-ponderantly Mexican at the beginning of the Texas Revolution. 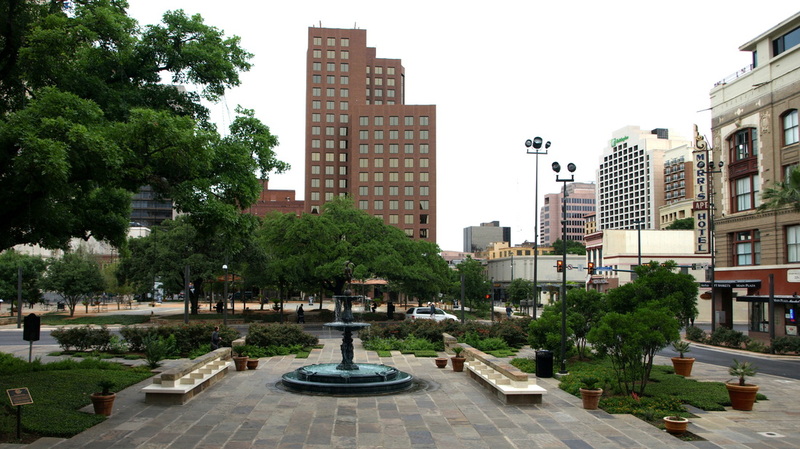 "The newly formed Bexar County covered much of the western edge of settlement in Texas. During the late Mexican period, Texas had been divided into four departments, with the department of Bexar stretching from the Rio Grande to the Panhandle and as far west as El Paso. With the winning of Texas independence, the departments became counties, and on December 20, 1836, Bexar County was established, with San Antonio as county seat. 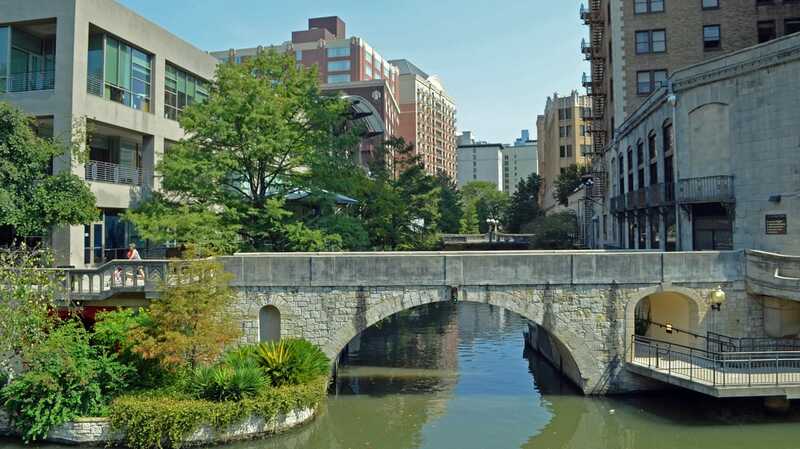 Since 1860, when the partitioning of Bexar County began, 128 counties have been carved from the original county, ..."
Bexar County is, of course, home to the Alamo and the Paseo del Rio, known as the River Walk. 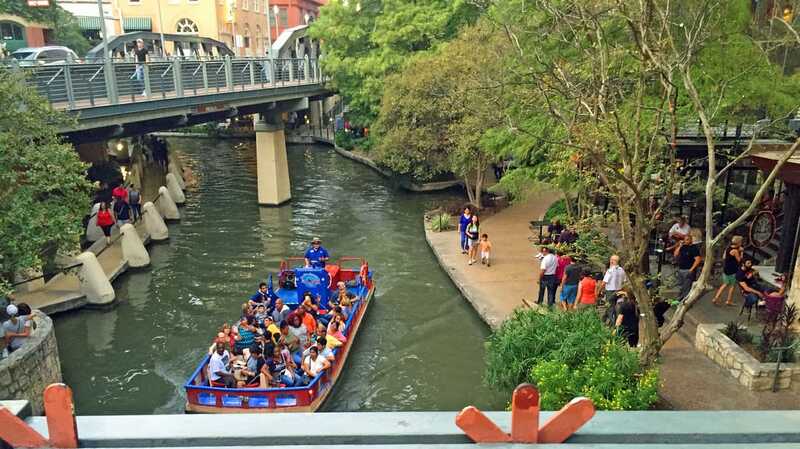 Both are in downtown San Antonio. I visited Bexar County and photographed the courthouse on May 2, 2011 and on October 10, 2015. 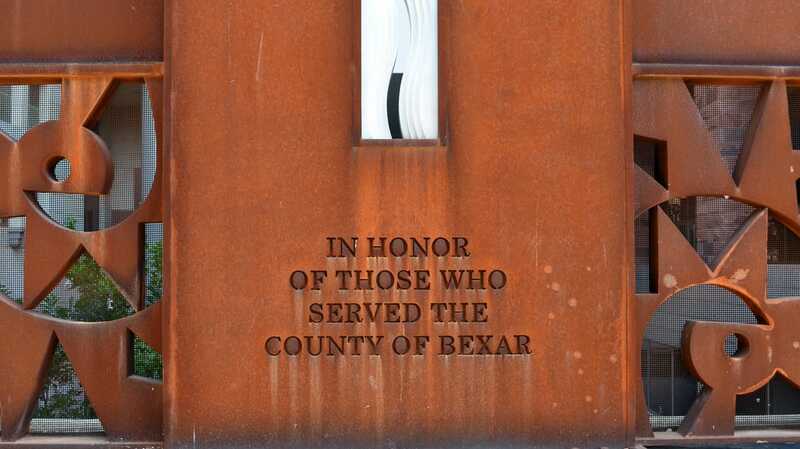 Bexar County is one of seven Texas counties in which I've lived. I taught architecture at The University of Texas at San Antonio from 1983 to 1987. More importantly, our daughter was born in San Antonio. from 1892 through 1896 under the supervision of George Dugan, Otto P. Kroeger and David Hughes. 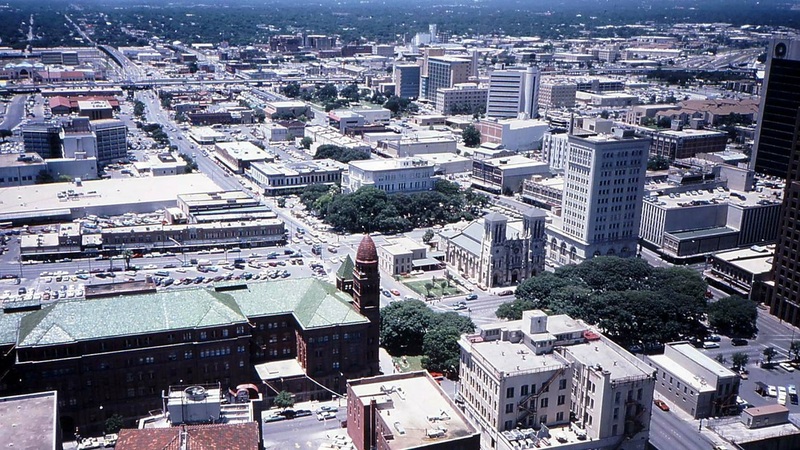 Scanned from a photograph I took in 1986, this view of the courthouse and plaza is from the Tower-Life Building. 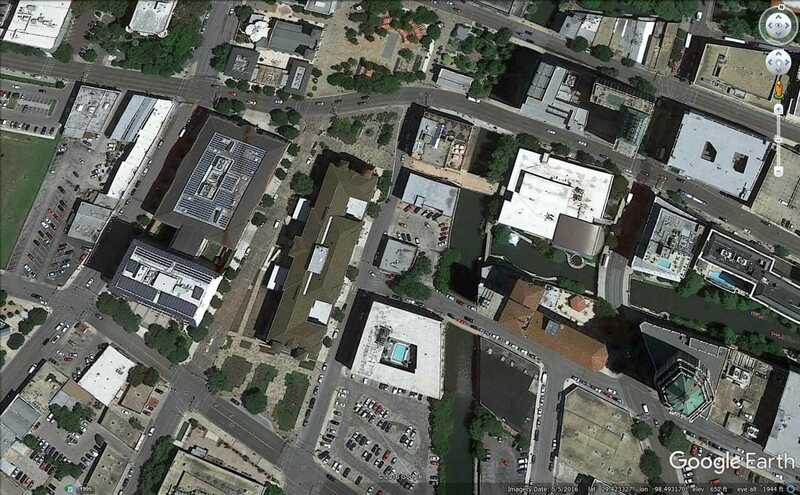 Google Earth view in 2012, before the 1968 & 1972 additions were removed from the west side of the historic courthouse. 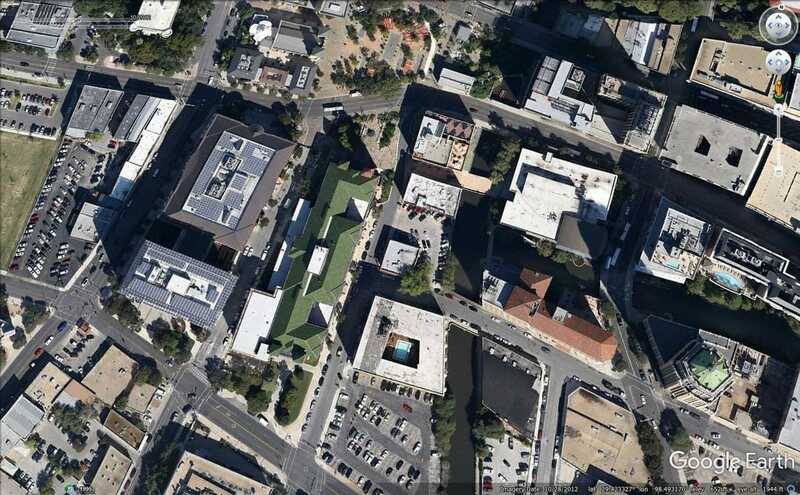 Google Earth view in 2016, after the demolition of the additions on the west side of the historic courthouse. Bravo, Bexar County! 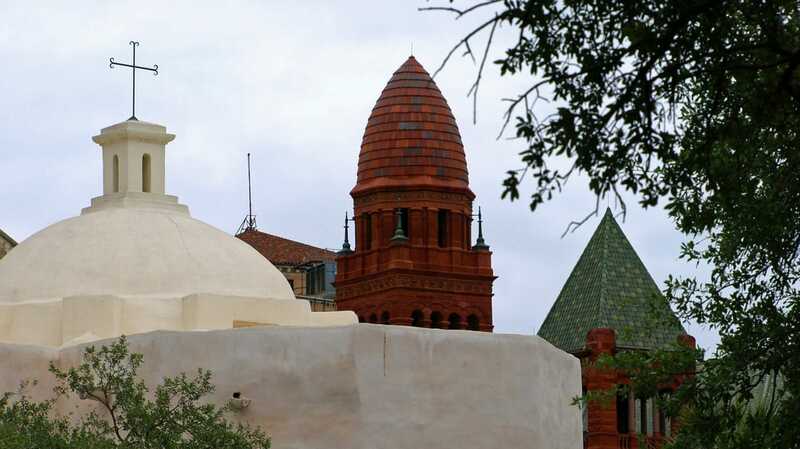 The courthouse towers and the San Fernando Cathedral dome. 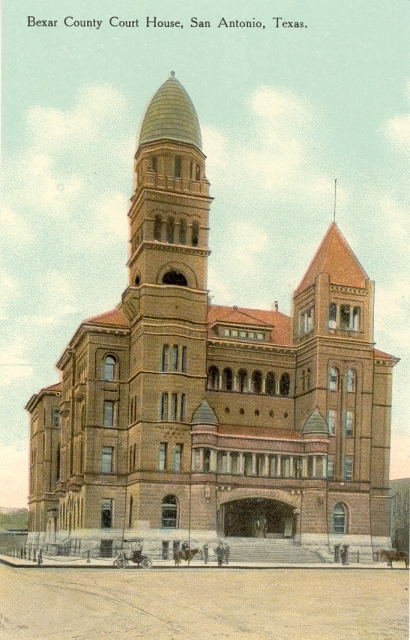 The 1892 courthouse entrance faces north on Main Plaza. The view of Main Plaza from the courthouse steps. 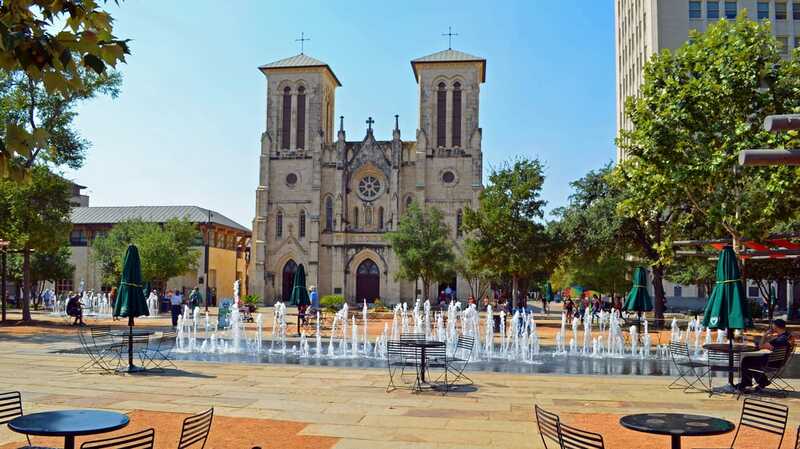 The historic San Fernando Cathedral is on the west side of Main Plaza. The east facade of the courthouse, looking north. The north facade of the courthouse, viewed from Main Plaza. The east side of the courthouse, looking south. The northeast corner of the 1892 courthouse. 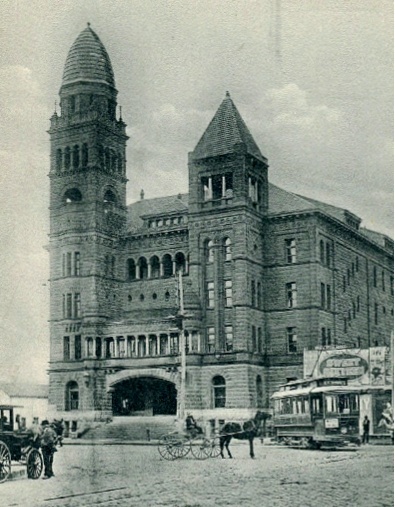 Since 1897, the Courthouse has had 4 major additions. The first occurred in 1914 and the second was an extensive remodeling and expansion in 1927. Those additions were sufficient to meet the County's space needs until 1963 when an additional 9,000 square feet were added. Finally, the addition built in 1972 added almost 39,000 square feet at the southwest corner of the building. 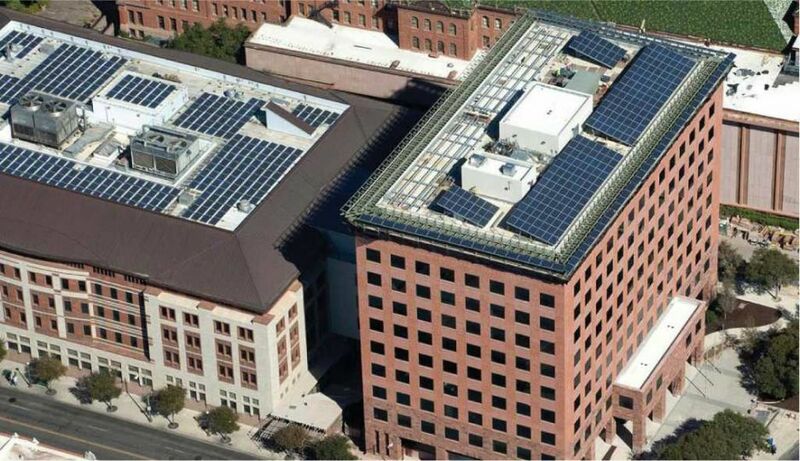 Presently, the total square footage of the Bexar County Courthouse is approximately 300,000. 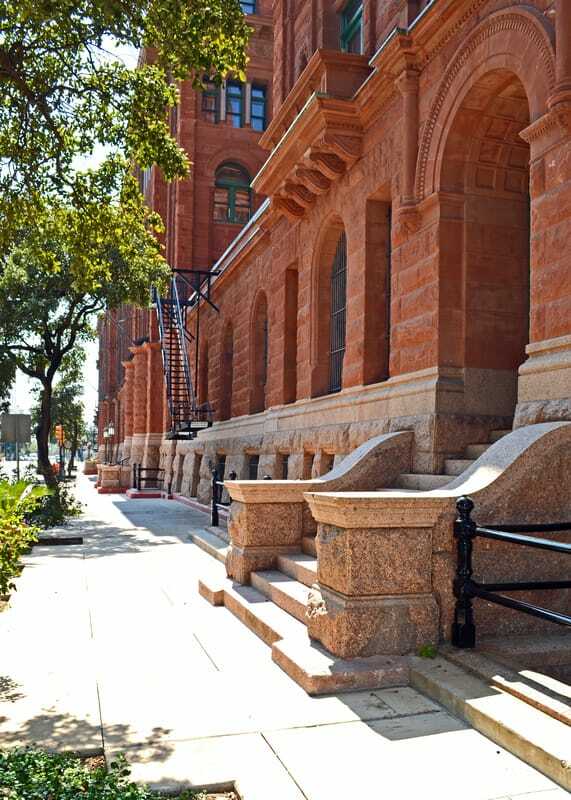 In 1992, the Bexar County Commissioners Court developed a plan that envisioned a restored historic courthouse with modernized infrastructure so that it would remain relevant and in daily use. 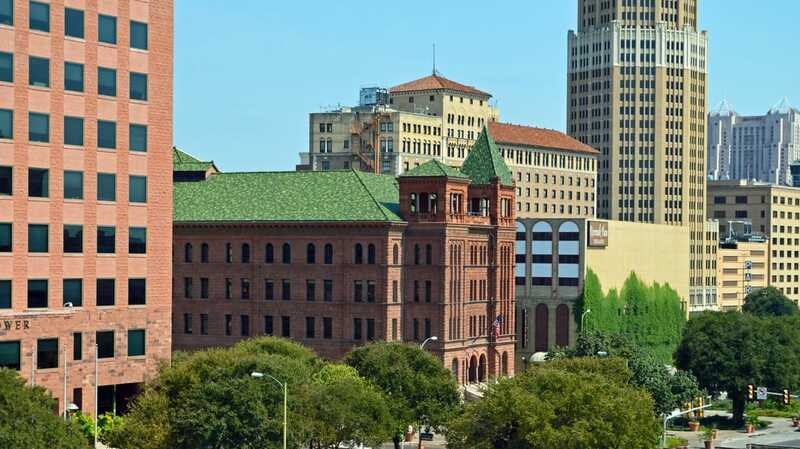 Commissioned to create the master plan, 3D/International created and published A Historic Preservation Master Plan for the Bexar County Courthouse. 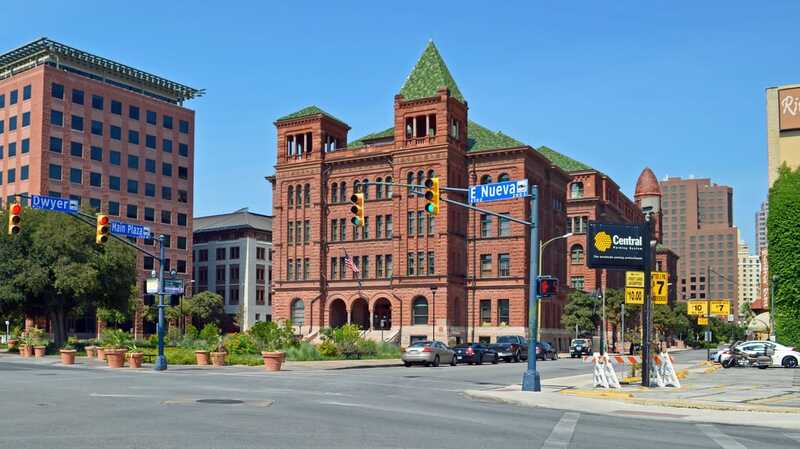 Presented to the Bexar County Commissioner's Court in February 2000, the plan followed the guidelines established by the Texas Courthouse Preservation Program, initiated by then Governor George W. Bush and authorized by Texas House Bill 1341. 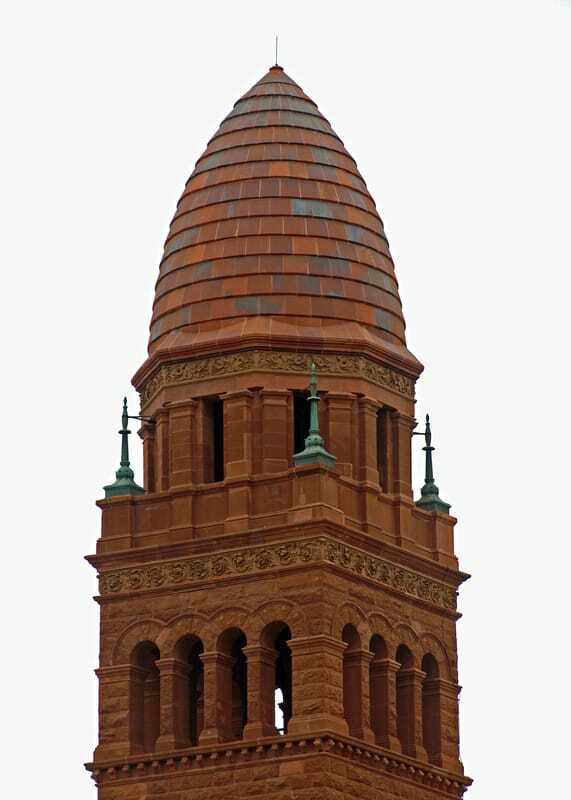 The Historic Preservation Master Plan for the Bexar County Courthouse is based upon the 1927 renovations and additions to the structure. Taking the building back to its 1927 appearance will recapture the grandeur of an era and firmly re-establish the historical significance of the Courthouse. 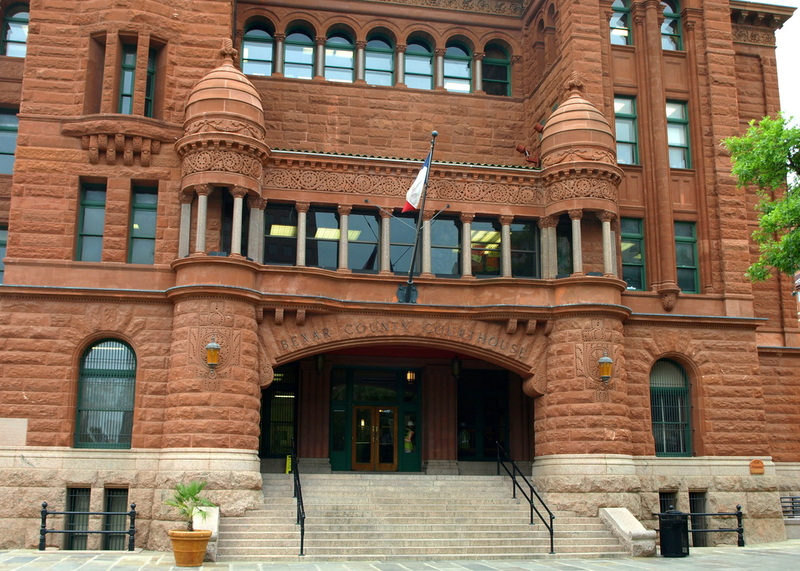 The Bexar County Commissioner's Court has directed that the primary use of the Courthouse be as a space for civil courtrooms. As such, the courtrooms, judge's chambers, jury deliberation rooms and courtroom support office spaces are defined as a "court suite." Fortunately, many of the 1927 era courtroom spaces are still used for that purpose today. 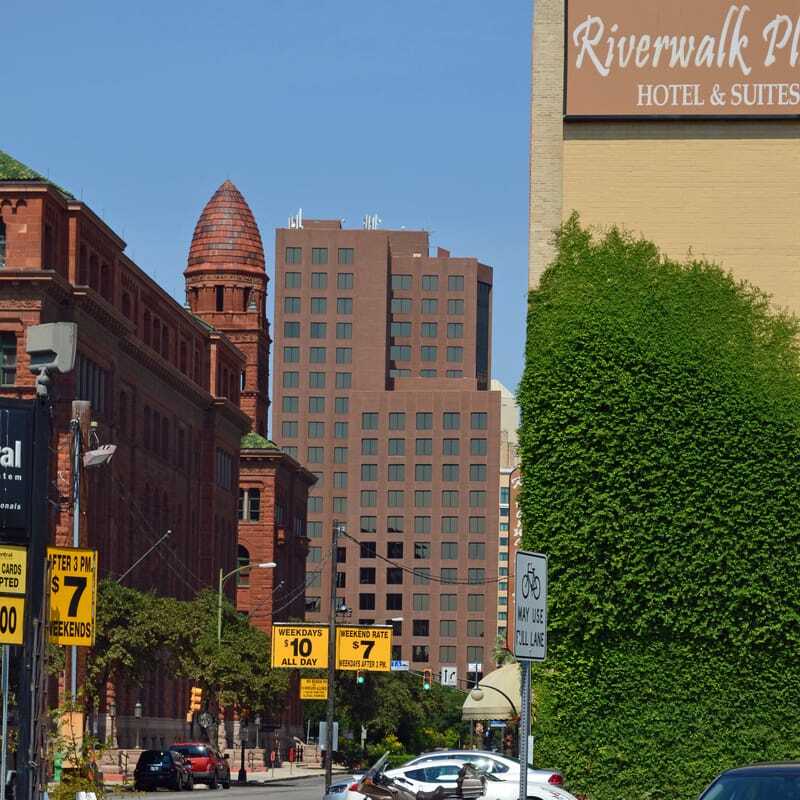 However, many of the most significant architectural details have been hidden behind modern facades and are in tremendous need of renovation to preserve and maintain the historic character. 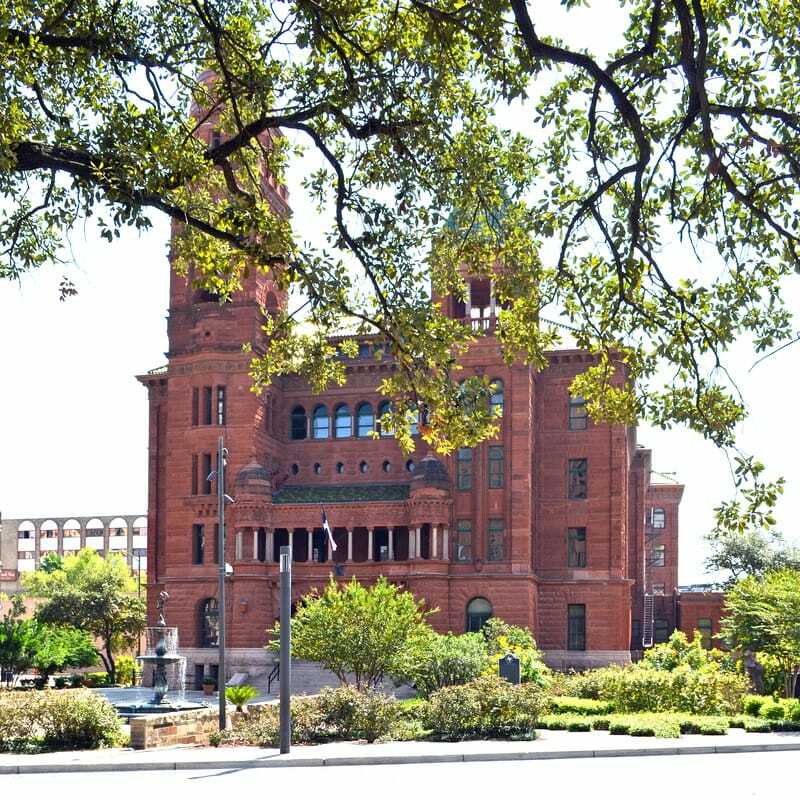 The restorations outlined in the "Historic Preservation Master Plan for the Bexar County Courthouse" will return the Courthouse to the original dignity and stateliness prescribed by the earlier visionaries of Bexar County. 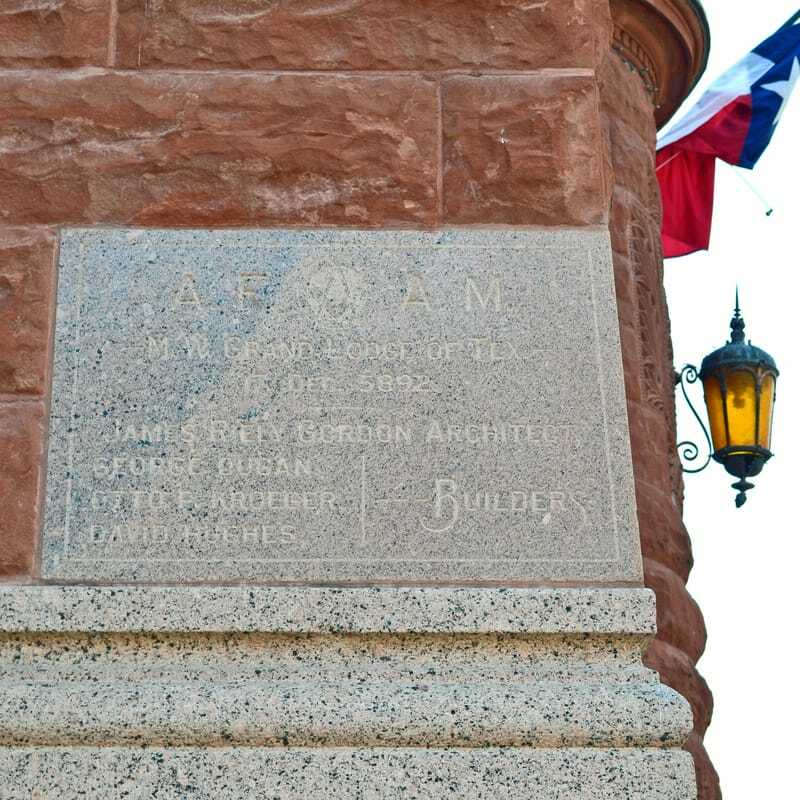 This project includes the restoration of the exterior historic masonry of the Bexar County Courthouse. 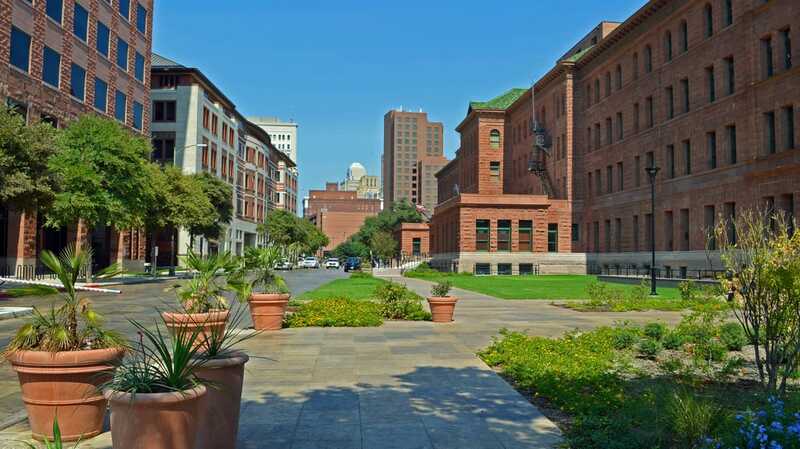 Restoration includes demolition of 1968 and 1972 additions, restoration of the stone and terracotta, restoration of the existing windows, rehabilitation and reconstruction of fenestrations and replacement of missing windows. 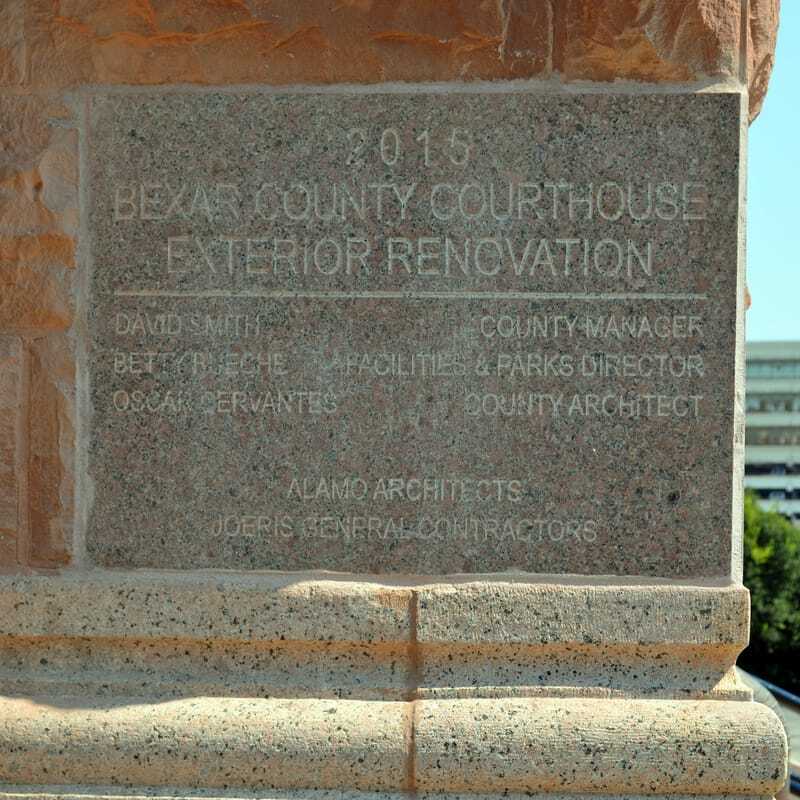 Bexar County officials gathered at the County Courthouse to celebrate the building complex’s $9.1 million restoration project on July 14, 2015. 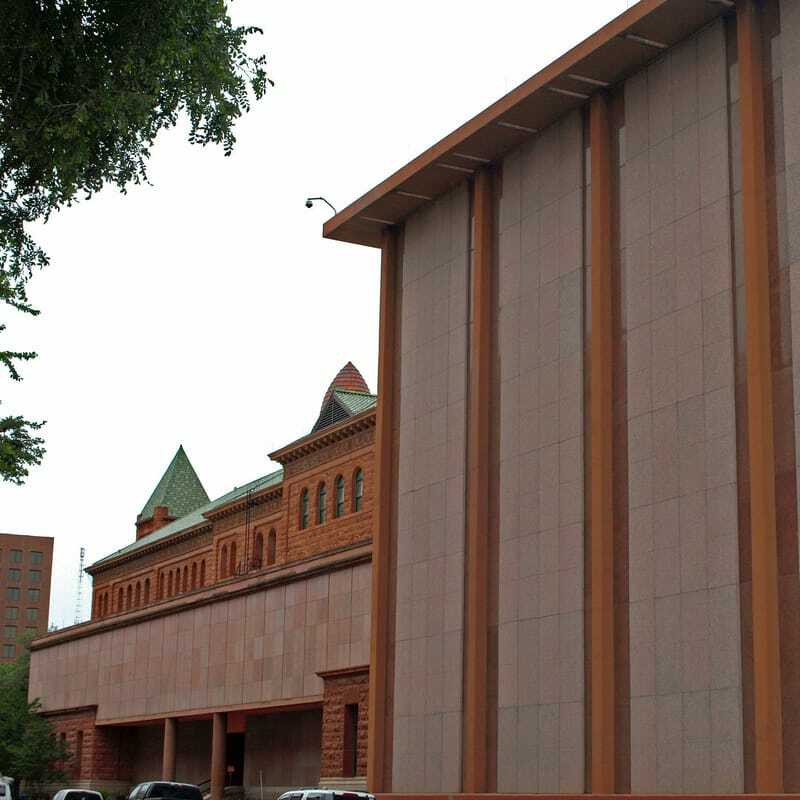 The project, funded by the Texas Historical Commission, the Hidalgo Foundation of Bexar County, and other general funds, removed two additions built by architect Edward Gondeck in 1963 and 1972 and restored the courthouse’s original exterior. 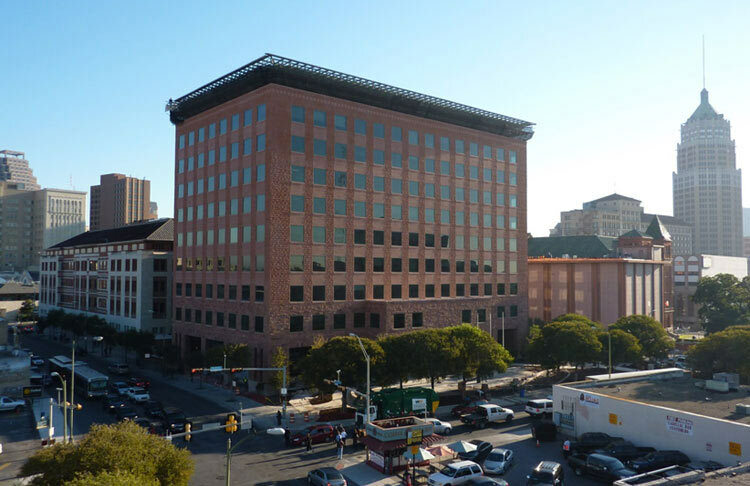 The windowless addition to the backside of the Courthouse was seen as an eyesore to many. Construction began in late 2013 to remove the additions, thus unveiling the building’s original granite and red sandstone structure designed by architect James Riely Gordon. Instead of tearing down the original structure to construct the addition, Gondeck left a gap between the original building and the additional structure, allowing for a relatively simple demolition. “When we started taking it down, the building was in great shape and we just had to restore some of the windows,” Judge Wolff said. The Gondeck addition provided courtroom and office space for decades, but in 2011 the addition was found to be structurally unsound. The Commissioners Court requested a grant from the Texas Historical Commission to restore the courthouse to its original state. The 1968 & 1972 additions are visible on the right in this view of the Elizondo Tower. 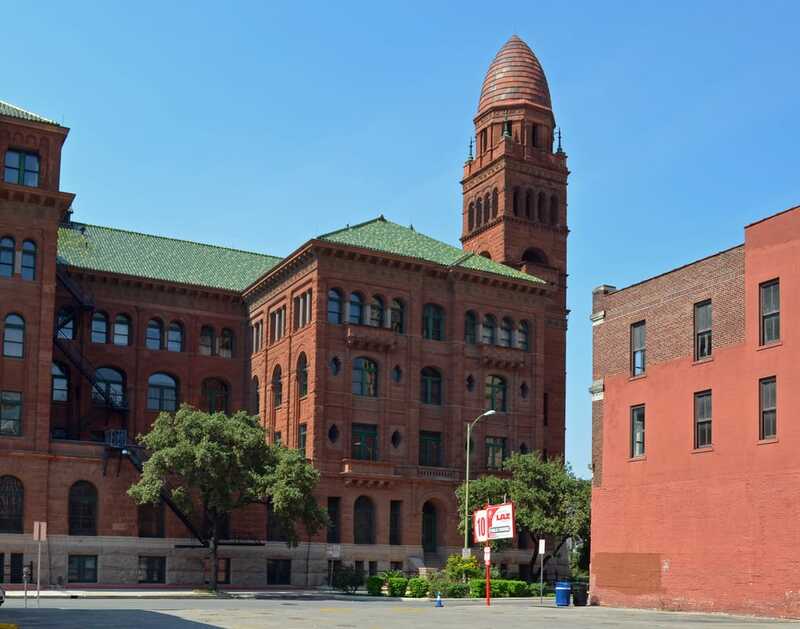 The 68 & 72 additions enveloped the historic courthouse on the southwest side. The 1927 courthouse addition is on the right. 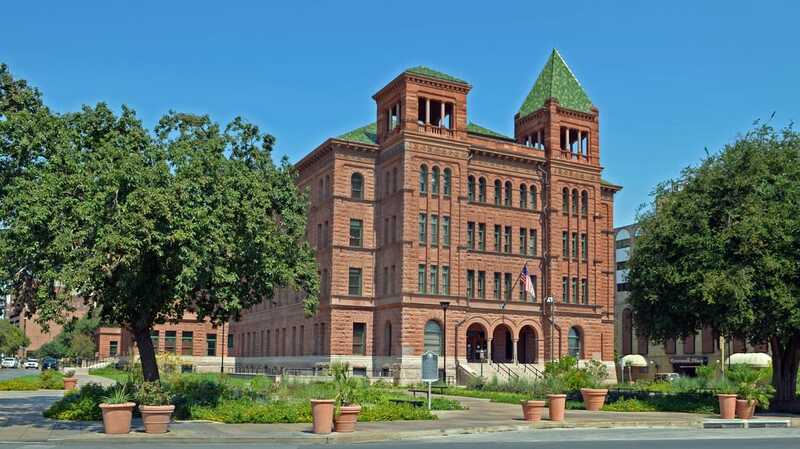 2015: the 68 & 72 additions have been removed and the historic courthouse restored. The southwest corner of the 1927 courthouse addition. To the right of the courthouse: the Smith-Young/Tower Life skyscraper, the Tower of the Americas, and the Alamo Dome. The south facade of the historic courthouse. 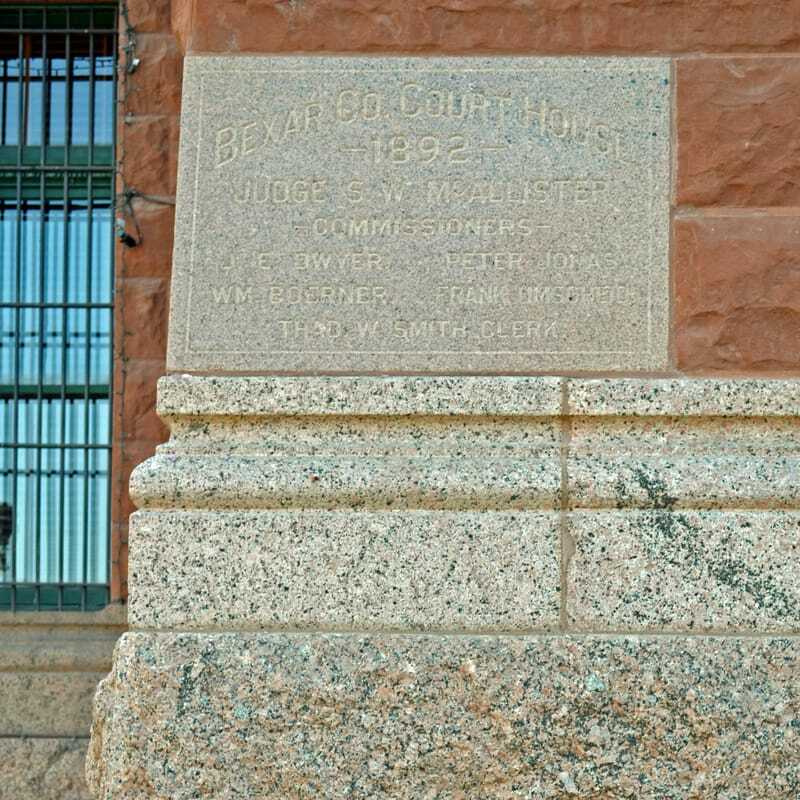 The 1927 courthouse addition cornerstone. Looking north on the west side of the courthouse. The west entrance to the courthouse. 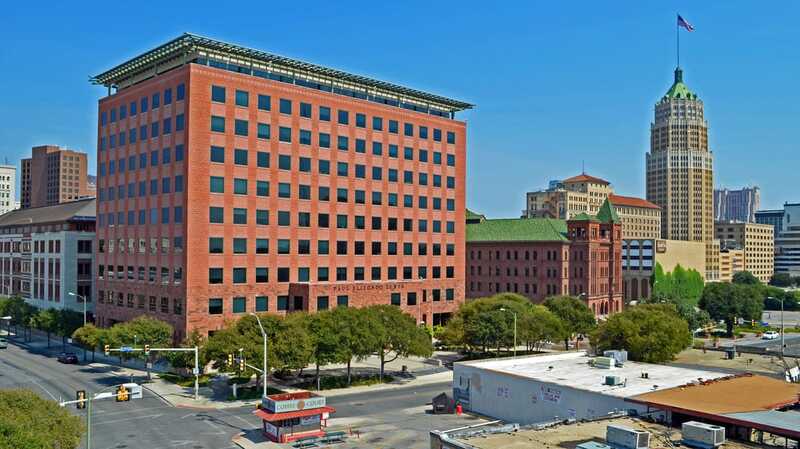 The Bexar County courthouse is a block west of the San Antonio River. 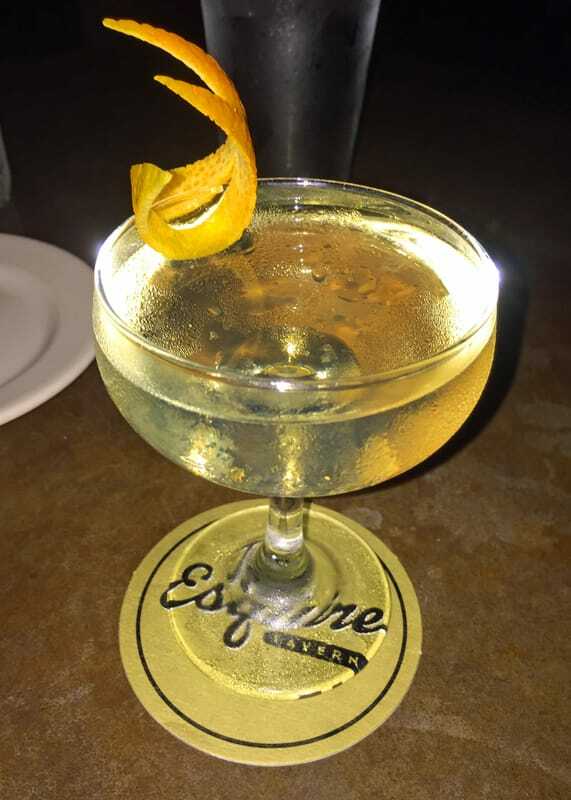 After touring the Bexar County courthouse, I highly recommend a cocktail, overlooking the Riverwalk at the Esquire Tavern!